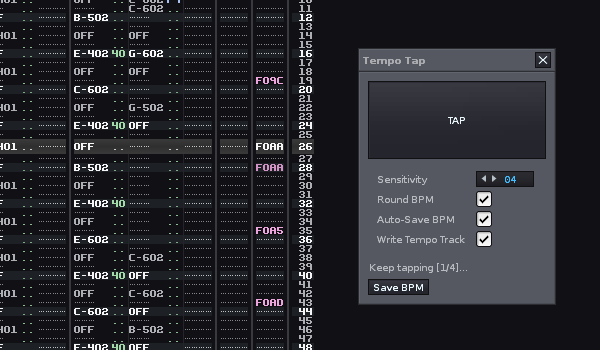 Sets or finds a new BPM value by tapping the beat on a really big button. Includes an option to create a tempo track in which TempoTap writes tempo commands as you tap along the music. Adds a new context menu entry 'Tempo Tap' to the 'Tools' menu. Apart from clicking the button, you can press almost any key on your keyboard. Pressing the Enter key will save the Tempo. - The TAP button can now be MIDI Mapped. - Keyboard key repeats are ignored. You can now hold down a key without letting the tempo go haywire.